Submitted photo Stephen Jacquemin, associate professor of biology and research coordinator at Wright State’s Lake Campus, led a study documenting changes in water quality following the implementation of new rules and best management practices. CELINA — Wright State University’s Lake Campus and its researchers’ studies of the water quality of Grand Lake St. Marys are seen as a model to further reduce algal bloom issues in other bodies of water in Ohio, including Lake Erie. Collaborative efforts between agriculture and water quality groups surrounding Grand Lake St. Marys were highlighted by Ohio Gov. John Kasich and other state officials July 11 during a news conference. Jim Zehringer, director of the Ohio Department of Natural Resources, referenced the work being done at Lake Campus by Stephen Jacquemin, associate professor of biology and research coordinator. “In a recent study, Dr. Stephen Jacquemin, from Wright State University-Lake Campus, found that there has been a significant reduction in the amount of phosphorus loading occurring at Grand Lake St. Mary since the ‘Watershed in Distress’ was implemented in 2011,” Zehringer said. Jay Albayyari, Lake Campus dean and chief administrative officer, praised Jacquemin’s research, which also involves Lake Campus students. “The vision I have at the Lake Campus, to merge water quality and agriculture studies with the research being done to improve Grand Lake St. Marys, is being realized,” Albayyari said. In February, the Lake Campus opened the doors to its Agriculture and Water Quality Education Center, a state-of-the-art facility that houses labs and classrooms dedicated to these interrelated subjects. More than 65 students study in these areas at Lake Campus. 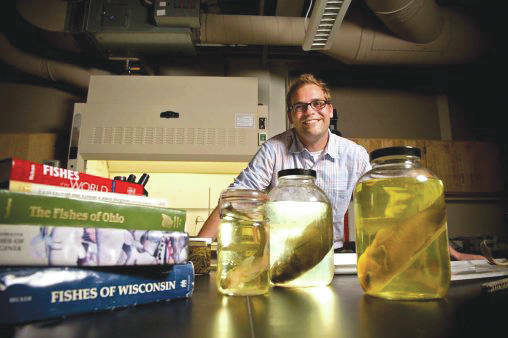 https://www.fairborndailyherald.com/wp-content/uploads/sites/50/2018/07/web1_lakecampuswater.jpgSubmitted photo Stephen Jacquemin, associate professor of biology and research coordinator at Wright State’s Lake Campus, led a study documenting changes in water quality following the implementation of new rules and best management practices.